Mobile phone operator Orange has launched a gadget recycling scheme. It is offering the public the chance to earn money from their unwanted mobile phones, laptops and personal music players. Under the Recycle and Reward scheme, members of the public can bring their electronic goods to an Orange store and will receive a range of cash rewards. A recycled Nokia N95 can fetch up to £85 while a Sony Ericsson C905 could make £95. Orange estimates that two-thirds of UK households have old mobiles lying around which equates to approximately 90 million handsets worth around £450m. "Recycle & Reward is just another small step for us, as a business and for the public, in our journey towards greener, more sustainable practices," said Paul French, head of Care Products at Orange. Lots of firms are jumping on the recycling bandwagon, largely because of the European Union's Waste Electrical and Electronic Equipment Directive (WEEE), which obliges manufacturers and retailers to allow customers to recycle their obsolete devices. 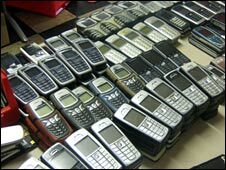 Mobile phone trade-in website FoneBank offers cash for old mobiles, and sends many on to the developing world to be used again. Many charities also ask people to donate phones in order to raise funds.